Generally we test loss by a FOTP-171 test, where we mate a cable to test to a reference launch cable attached to our test source and measure the loss. Or we use OFSTP-14, where we use both launch and receive cables to measure the loss of the connectors on both ends. Either way references loss to the output of the launch cable. Sometimes, this doesn't work or even make sense. Consider most cables of plastic fiber. These are used in links that have one cable and no interconnections. Sometimes, POF connectors don't have connector to connector mating adapters to allow connecting up to a launch cable. 1. 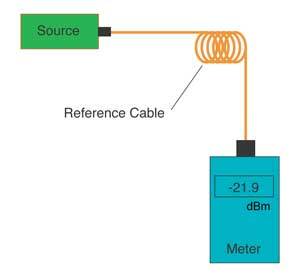 Attach your known good cable (the reference cable) between the source and meter and measure the power transmitted through it (in dB or dBm, like all other loss measurements.) This is your reference power. 2. Replace the reference cable with the cable you want to test. Measure the power through this cable. 3. Calculate the difference in power in the two measurements by subtracting the two power levels. If your reference measurement was -20 dBm and your test cable was -23 dBm, the difference is -23-(-20)= - 3 dB. If your test cable was -18, the difference is -18-(-20)=+2 dB. 4. Repeat the test with the cable reversed. What Does The Measurement Mean? The difference in two power measurements is the relative difference in the transmission of the cable under test to the transmission of the reference cable. It isn't a cable loss, per se, it is just a transmission measurement compared to a cable you think is good. The measurement can be +X dB or -Y dB. A positive number ( +X dB ) would indicate the cable tested had better transmission than the reference cable. A negative number ( - Y dB ) would indicate the cable tested had worse transmission than the reference cable. Your decision for what is a good or bad cable would be how much better or worse transmission than your reference cable your system can tolerate. If you have a link that works, make an attenuator using a gap-loss in a short test cable and add loss until the link no longer works. Then test that cable using the cable substitution method compared to a short reference cable. It should have fairly high loss, like 20 dB or so. This is then your maximum loss you can allow any cable to have. The big source of error here is the variability coupling to the source. It is less an issue with large core plastic fiber coupled to a LED than with a small glass fiber where tiny tolerances make big differences in coupled power. And of course, the test gives little information on how much loss a connector will have when coupled to another fiber. So we recommend this test only for POF links where the cable goes directly from source to detector.